Various things make me try out new games. Sometimes it is an advertisement, other times it is a recommendation from a friend. Other times I am just browsing lists of releases and pick one at random. Today I am going to review a game I picked simply because of its title. Heldric — The legend of the shoemaker (Heldric for short) is a game which attempts to combine two genres: hack-n-slash fantasy games and tower defence games. For good measure, the developers have thrown in a touch of town building/planning. The basic back story of Heldric is that the king’s army is away fighting evil and, while the army is away, the villages of the kingdom need to fend for themselves. This is a bit of a problem as groups of nasty monsters keep wandering into the towns and killing folk. Our job, as shoemaker and wannabe-knight, is to help the villagers organize themselves. We put resources toward building village infrastructure, defences and weapons. Then, when the baddies attack, we lead the villagers in melee combat, charging in with sword and bow in hand. The game is essentially divided into two modes. In the first mode we are given some money and a few villagers and given some quiet time in which to build defences. We can build homes (which increase the population and our building resources), we can build walls (to keep out the enemies) and we can build things like blacksmith stations in order to craft weapons. After a few minutes of this quiet time the game shifts into combat mode. A few waves of baddies come out of the wilderness and attack our village. It is our job to help the villagers get to the proper places to intercept the enemies, lay traps and attack the onrushing foes. So far as I have been able to tell, the combat mode either ends when we kill all the enemies or when Heldric is slain. Once the combat is over, we return to the quiet building mode and have a few minutes of peace in which to construct more buildings and defences. The Heldric game is laid out in a series of challenges which we can access using a map of the kingdom. Each spot on the map presents a level with a slightly different location and new buildings and/or challenges. The game seems to get gradually more difficult at an easy pace and I was pleased to see each level can be played at a varying level of difficulty. This is especially nice early on when we are learning the basic controls. All in all, I found I really enjoyed playing Heldric. Part of it is the concept. I’m a sucker for building simulations, but I find they can get boring. I really enjoy third person hack-n-slack games, but find the grind to kill X number of foes to level-up can get tedious. 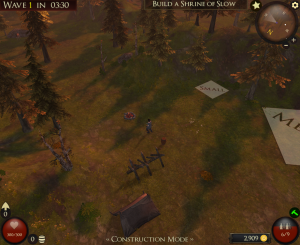 Heldric does a really nice job of giving us a building sim that takes breaks for combat and a hack-n-slash game which automatically takes breaks to let us plan and level up. There were other good aspects too. 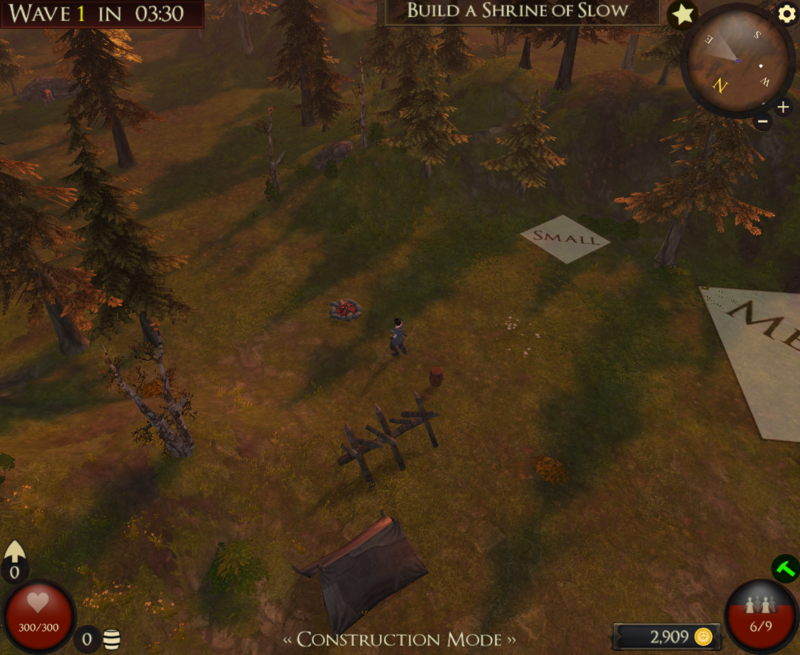 For example, the villagers do need our help with building and combat, but they generally do okay on their own too. This isn’t a game where the AI plays dumb, the villagers will fight on their own and heal themselves between rounds, letting us focus more on the big picture and less on micromanaging. The user interface is well laid out and I found everything was where I where I expected it to be; the controls worked exactly as I hoped they would. The interface gives a lot of information on the current situation without being distracting or getting in the way. I also like that, between combat rounds, we can wander in the woods to gather resources, practice combat by hunting animals for resources and lay traps. Heldric may not have top level graphics (though I found them to be pretty good) and it may not be as deep or complex as “pure” building sims or fantasy role playing games. What it does do is provide a great, somewhat casual, gaming experience that very smoothly combines elements of different genres. There is a demo of the game on Steam we can try for free that includes a few levels and the full game costs just under $10, making it an attractive purchase in my option, considering all the fun I have had with Heldric.